At the launch of both Toyota and Daihatsu, has not been informed what the price of their latest duet Toyota Agya and Daihatsu Ayla. However, Agya and Ayla, consumers can be ordered from the beginning of 2013. Johnny Darmawan, president director of PT Toyota Astra Motor said today that he has not set the selling price Toyota Agya. Similarly, the sales targets. 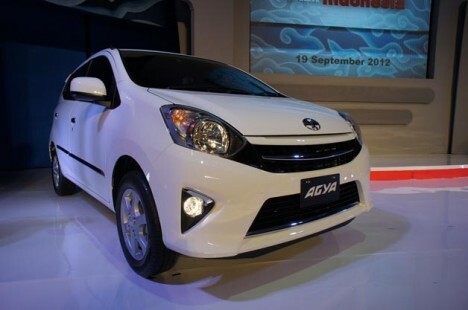 But he hopes Agya-Ayla could continue the previous successful collaboration through Avanza-Xenia, and Rush-Terios. From the side of the body, Agya same class cars more populated city car Nissan March, Mitsubishi Mirage, Hyundai i10, Kia Picanto, Daihatsu Sirion, Suzuki Splash and Suzuki Estilo. Both of these compact cars, reinforced 1KR 998 cc engine DOHC Fuel Injection, similar machines such as those used iQ and Aygo only with different settings. Engines produce power 65 ps at 6,000 rpm engine speed and maximum torque of 86 Newton meters achieved at 3600 rpm. Agya offered in six colors; White, Silver Metallic, Black, Grey Metallic, Light Blue, Dark blue metallic and the exclusive color Agya. For the first 5 colors are also the same as Ayla, plus a special color Light blue metallic.